Adina is safely on her ship and her merry crew of two are now officially landlubbers once more. Our final night was spent in Francis Bay on the pretty island of St John in the US Virgin Islands where friends Don, Phylis, Ken and Eiloo came to join us. 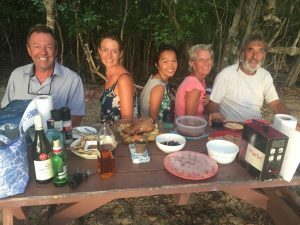 We planned to meet for some beach sundowners which in the sailing world means you bring drinks and nibbles – usually you bring what you want to drink and food to share. Eiloo brought out something wrapped up in tin foil and announced it was “Roast lamb”. We all had a giggle – who in their right mind knocks up a lamb roast on their boat? “No, I’m being serious!” and she unveiled rather spectacularly a lamb roast including roasted vegetables. Wow! We had heard Eiloo is something of a talented cook and guess which is Tom’s favourite roast? Conversation flowed, we talked about plans and life in general until well past dark when we all went back to our respective boats. Overnight it started raining and come morning time it was bucketing it down. Outside you could hardly see a thing, not what we wanted. Our action plan meant we needed to take our sprayhood and bimini off to store and they were soaking wet. Our dinghy left in the water overnight was now a bath. A check of the weather forecast said by 11am it would be sunny which seemed hard to believe when you felt like you were in the middle of the Amazon forest. We held faith and as soon as the rain started to lighten we left, swinging by the boats of Solstice and Antares II to say our goodbyes. There’s nothing like an accurate weather forecast and the sun appeared and everything started to dry. Two hours and thirty minutes later we arrived in St. Thomas and there we could see MV Schippersgracht sitting on the dock empty and being made ready for carrying twenty-five boats to Southampton, England. The heart rate went up a little. We knew the first yacht was due to load at 1pm and, if everything went to plan on the ship, we as the fifth yacht in the sequence should load at 7pm, the last yacht for the day. We set to work, ticking off our list of final preparations. Our local agent, Traci, who had been very efficient and helpful, texted to tell us the schedule had been bought forward and we would load at 6pm. That accelerated the work load. The worst part is removing the backstay that helps hold the mast up. Fortunately we’d done a practise run but it was still hard work as we undid the giant bottle screws to make it slack ready to pop off as soon as we moved to load. In between working we kept an eye on the ship. The first boat, a small yacht, was easily brought up and secured by 2pm. The second boat was a catamaran and it was taking an age. Our hearts started to sink as it was only by 4pm that it was finally secured. Two hours and two boats loaded, two hours left for three yachts. The third was in place by 5.15pm and we were due to move at 5.30pm. 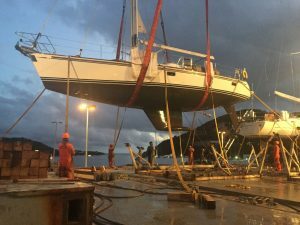 Our agent Traci said to keep an eye on the fourth yacht and as soon as it was at deck height to let her know and she’d contact the loadmaster. Come 6pm we saw it rise above the deck and sent a text advising we were all ready, backstay was slack, almost pleading. The phone rang – 30 minutes until you load, get ready. Heart beat goes up. We popped the backstay. The forestay now having no sails to hold it swung rather merrily. We crossed our fingers. We raised anchor and slowly motored to the ship, incredibly slowly as we feared for the unsupported mast toppling over. In our heads we still couldn’t believe we’d have to raft up to the ship. You just don’t do such things. Ships are big, chunky pieces of steel, scratched all over and used to working in rough docks. Yachts are tender things, things of beauty, made for graceful sailing and being anchored in pretty places. Fenders out we got a wave, yes, we had to go alongside the steel walls of the ship. Add that to your sailing CV – rafted up to a ship. Huge yellow straps were thrown down and landed on deck and Susie secured them to our cleats. We saw the ladder that we believed we would have to climb and had often chatted about. Next thing swarms of men descended and more straps came down and it was a hive of activity. The slings appeared on the crane and dipped into the water. A diver helped them in position. The loadmaster co-ordinated it all. They were a slick bunch of operators who did this as a profession, most of them English and usually based in the Mediterranean. Before we knew it Adina was being hoisted out of the water! All that talk about whether we should go up with the boat or climb the ladder and we were on our way up with a whole bunch of us on deck. We’ve stayed on the boat being lifted out by travel lifts but this was much smoother – just like riding an elevator. Darkness descended as we stepped off once level with the ship’s deck and then Adina was lifted over us into the night sky and positioned for her cradle. Lowering her into her cradle took a fair while as everything has to be spot on. Finally she was down and we praised the fact that Adina has several extra cleats, and chunky ones at that, as she was firmly strapped in place. She was positioned on the starboard side of the ship, one row from the back. We climbed a step ladder to board Adina for the last preparations. By now we were pretty tired and we had to get the backstay back on. Part of that requires sitting on the back step from where normally if you fall off you fall into the water, now if you fell off you’d break some bones. The cargo ship didn’t even have sides and we were right at the edge of it. Vertigo and fatigue played their part. The loading crew had finished for the night so now it was just the two of us and one man left to help get us off the ship. We worked hard, lowered our bags to the ship deck and disembarked. We were now landlubbers. Overnight we stayed in an Air BnB and were very grateful to our hosts who came to pick us up. Once there we booked our flights and this afternoon we fly to the big apple, New York. We will visit Susie’s cousins and we’re going scouting for business ideas. Tom has always fancied setting up his own retail business and we’ve been brainstorming away but alas are far from anything concrete yet. Some have already asked does this mean another blog? Perhaps, perhaps! A week today we fly back to London and Adina is due home in the week of 22nd May. We’ll pick her up and set to making sure she is all spick and span for a new set of custodians who we hope will take her on some new adventures. For now we’ll keep the blog going a little longer with a few small updates on Adina but the tracker alas has been pinged for the last time. Our thanks to Traci who has been a super-efficient agent here in St Thomas and to the crew who last night loaded Adina so professionally. And as for us – we’re going to enjoy showers without worrying about watching the water! It does feel good to be back on land and we’re back with a treasure chest of wonderful special memories from our time spent living at sea and we are excited and looking forward to our next challenges. Feeling teary at the thought of it all?! We will be in UK that week 22nd May. Is the ship en route Southampton? Perhaps it could be possible to meet? I’m sure all will be well with Adina. We will be in UK the week she arrives, will the boat dock in Southampton?